First Order members (brothers, and — God willing, in the future — priests) take the three traditional vows of evangelical perfection (poverty, chastity, and obedience) and an additional fourth vow to make the Doctrinal Crusade of Saint Benedict Center their life’s first interest. 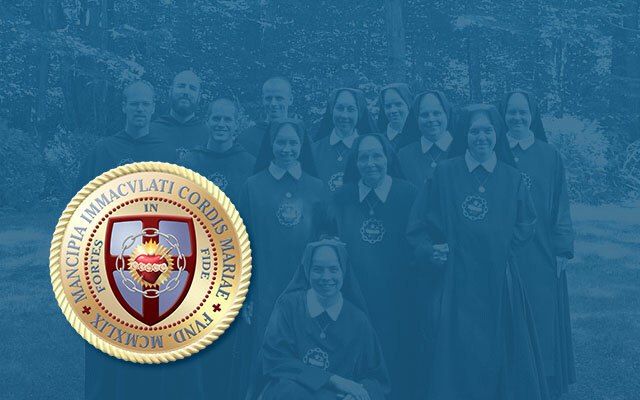 As with all religious, active and contemplative alike, the “ora et labora” (pray and work) motto of Saint Benedict is applicable to the Slaves of the Immaculate Heart of Mary. Our daily prayer life consists of the Holy Sacrifice of the Mass (in the traditional Roman Rite), the offices of Prime and Compline, the Angelus thrice daily, examination of conscience, spiritual reading (individual and common, from Holy Scripture and the great spiritual masters), meditation, and the Holy Rosary. Our work consists of study, publishing, teaching, public evangelizing, and manual labor. Although, according to his own prudence, the Superior employs the native talents of the brothers as well as possible for the good of the community, no brothers are exempted from their share of humble manual labor. Although, according to his own prudence, the Superior employs the native talents of the brothers as well as possible for the good of the community, no brothers are exempted from their share of humble manual labor. Besides the obvious requirement of adherence to our ideals as outlined in the opening of this booklet, men presenting themselves to our congregation must meet additional criteria. Candidates for the First Order should be between the ages of 16 and 35 (although in rare cases, this upper age limit may be waived). They must be in good health, docile to authority, and “normal” (i.e., devoid of eccentricities and strange personal habits). While scholarliness is not requisite, they must exhibit a sincere willingness to learn. They must also exhibit the more important desire to grow in virtue, since the religious life is a “state of perfection” in which growth in virtue is a duty. …the religious life is a “state of perfection” in which growth in virtue is a duty. True desire to live in fraternal charity and to observe the holy vows is necessary. Lastly, they must not have any canonical impediment to entrance into the religious life. The period of formation consists of a six-month postulancy and a two-year novitiate, during which time the rule, the evangelical counsels, and the spirit of the congregation are studied. Upon entrance into the postulancy, the brother is given his religious name and his work habit. The habit of the congregation (the Roman Cassock) is taken when the candidate enters the novitiate. If the novice is admitted to vows, he first makes his three-year simple profession, receiving his profession Rosary (15-decade Dominican Rosary), which he wears in the fashion of a mendicant friar, on his left side, as his “spiritual sword.” After the three years of simple profession, the brother professes his perpetual vows. He is then a religious for life. The habit is worn at the monastery and in public. It is the brother’s clothing, not a costume. Further information on our life, formation, and spirit is available by visits to the monastery, the first of which may last up to a week. It is only with a candidate’s observing the community (and vice versa) that any serious vocational discernment can begin. To make an appointment to visit, serious candidates are invited to write or call. Contact information is provided in the front of this booklet.